Insoles and Beyond Review and GIVEAWAY! Since I’ve been dealing with the lovely condition known as Plantar Fasciitis, I have become very interested in insoles. So much so that nowadays I only wear two pair of shoes – my Sketcher’s and my running shoes – because I simply cannot deal with uncomfortable shoes. I’m happy to say that while my PF has gotten markedly better in the last couple of months, I still want my feet to be as comfy as possible. So when Ashley at Insoles and Beyond (insolesandbeyond.com) emailed me with an offer to try a pair of their insoles, I jumped on it! Insoles and Beyond is a small, family owned company out of Chapel Hill, NC and I am all about supporting small businesses. I much prefer to deal with a small business whenever I can so I am happy to promote this company. Ashley was easy to work with and offered suggestions of the type of insoles I might like based on my needs. Ordering from their website was easy and the shipping was fast (and also free for all US orders!). I had no issues, but I’m fairly certain that if I’d had any, Ashley would have been available to help solve them. Insoles and Beyond offers many types of insoles – for running, for everyday wear, for work shoes…pretty much any need you have, they’ll have an insert to meet your need. 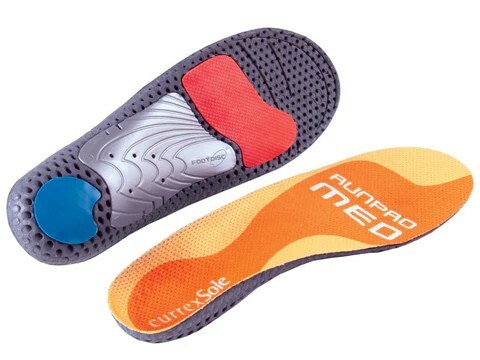 I ordered the currexSole RunPro Medium, based on Ashley’s recommendation for an insole to go in a running shoe that would also be good for PF. I put these insoles in my current running shoes and man, they felt good!! For the first time in a long time, I noticed zero foot pain while on the treadmill. I am very happy with these insoles, and I will probably order more insoles to go in other shoes (I hate having to keep switching out insoles to go in other shoes, and besides I think it’s better to give insoles a day’s rest in between wearings). These are the insoles I have – easy to customize the fit and super comfy! Then come back here and let me know that you did all of that. It might seem like a lot, but really it only takes a couple of minutes to do all that (assuming you don’t get sidetracked and spend an hour on facebook, then another hour on twitter like I do). 🙂 If you don’t have a Twitter or Facebook account, that’s okay, just let me know in the comments. I want everyone to have a chance to win. You have until Wednesday night (3/12/14) at midnight to enter and I’ll announce the winner sometime on Thursday (3/13/14). So go have a look at their website and enter the giveaway. Insoles are one of those things you don’t really think about until you HAVE to have them. I say, don’t wait until you have foot pain – go ahead and make your feet comfy NOW. FTC disclosure: I was offered any pair of insoles from insolesandbeyond.com to try for free in exchange for my review. All opinions are my very own. Giveaway to be fulfilled by insolesandbeyond.com. PF is no fun. It took me about a year to finally have my foot feel normal again. I put insoles in everything even my slippers. I don’t have twitter but did do the newsletter and FB. Hope your PF gets feeling better soon. Liked them on Facebook (my Facebook name is Angela Saver), followed them on Twitter as @saverang, signed up for their newsletter & I made a comment on Facebook! I don’t need any insoles, but I can totally relate to your PF issue. I suffered with it for at least two years, and nothing I tried worked. It finally just went away on its own. The “structured” shoes and insoles that I tried seemed to make it work. I think my feet are weird and don’t conform to the norm, because I feel best barefoot and in flip flops. Arch supports are my enemy! Kindly disregard my comment on your b-day post that I thought was an entry for this give away. I actually reread this post, and followed instructions-amazing! So, I have followed Insoles and Beyond on Twitter, liked them on Facebook, and signed up for the newsletter. Looks like they have a vast array of insoles, and I hope that I win a pair to help this stupid PF go away! !